I recognize that for many years tried almost all operating systems and even donated money to one called SkyOS who promised an awesome OS for the time (2009) although it was forgotten. I also remember one that fit on a floppy programmed in assembly called MenuetOS and today continues its development. Created by the company Bell Labs and now maintained by Vita Nuova Holdings, offers an RTOS environment that can be adapted to any computer. Limbo is used as a language and is based on three principles: Resources as files: all resources are represented as files in a hierarchical system, Namespaces and standard communication protocol called Styx to access files on local or remote. 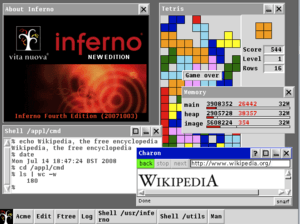 A company has compiled Inferno OS for the Pi. Although it's an Alpha, you can already try it but you can't do anything with it, because the mouse still does not work.